A 13-year-old girl, sold by her uncle and trafficked across the country as a maid, was found locked inside a Delhi apartment while her affluent employers holidayed abroad. 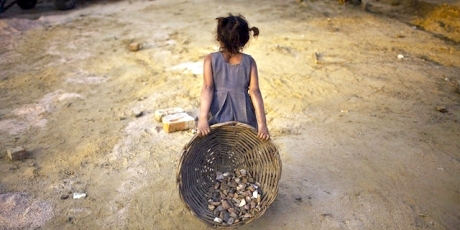 It’s time for us to end the shame of child slavery in India. This young victim is one of millions of India’s children who are sold from poor villages to huge cities, to find themselves enslaved as prostitutes or unpaid domestic servants. The police usually turn a blind eye to breaches of our laws on trafficking and slavery, but together we can push our Home Affairs Minister P. Chidambaram to punish those who profit from the heinous mistreatment of our children. Let’s stop ignoring the plight of India’s invisible children and call on Minister P. Chidambaram to set up a special task force that will examine how to stop all forms of child trafficking and exploitation, and ensure that the new Anti-Human Trafficking Units get the resources and power they need to act. The 13-year old’s story reads like a scene from a horror film. After being sold by her uncle to an agency then to the Delhi couple, she was only fed two chapatis a day, was routinely beaten by her employers and had to endure CCTV camera surveillance monitoring her behaviour at all times. But she’s not alone — India holds the shameful record of having more slaves than all other countries in the world combined, with at least 12.6 million children between the ages of 5 and 14 forced to work, often with little to no pay. The Indian government recently set up Anti-Human Trafficking Units in over 87 cities, but they widely ignore children being sold into bonded labour. Politicians think the public believes child servitude is normal for a country like India in the process of development, and this complacency makes children prime targets for exploitation. Only by correcting this myth can we ensure that child exploitation of all forms is recognised as a serious crime, and proper resources and attention are given to eradicating cruelty to India’s invisible children. We came together to fight for a less corrupt India — and we are winning. Now is our chance to fight for those who have no voice and bring justice for the children of India.